1. Jason Segedy on gentrification. This week we feature a guest column from Akron planning director Jason Segedy. You can’t build new housing in any existing neighborhood, it seems, without some invoking the specter of gentrification. Writing from the perspective of an economically lagging rust-belt city, Segedy makes the case that if we’re really serious about turning around city economies and promoting greater integration, we ought to be welcoming new housing investment. 2. More evidence of declining rents in Portland. A couple of weeks back, we flagged data from ApartmentList.com showing that rents in Portland had declined about 3 percent in the past 12 months. 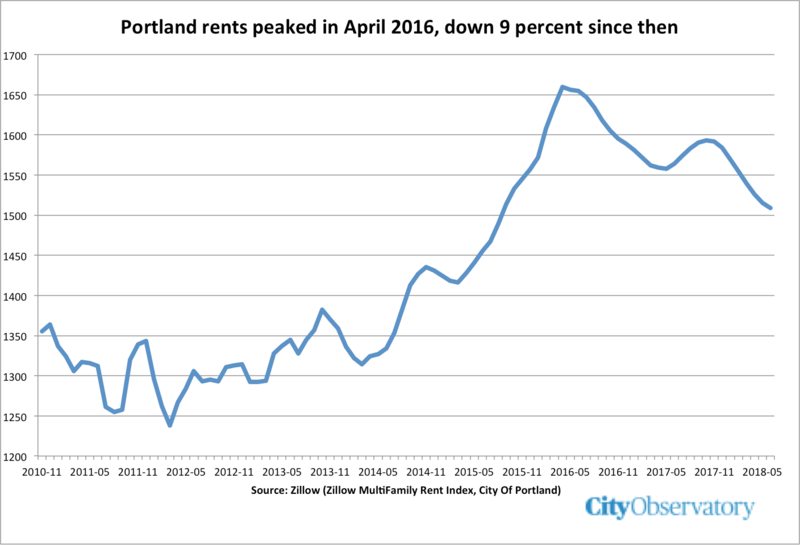 We decided to double check this against Zillow’s estimates of average apartment rents in the city of Portland: they show very nearly the same result: since June of 2017, average rents have declined about 3.5 percent. By Zillow’s reckoning, average apartment rents in Portland are down about 9 percent from the peak levels recorded in 2016. It’s a clear sign that the added supply of new apartments built in the city is putting downward pressure on rents. 3. New York City headed the wrong way with ride-hail cap. New York’s City Council is poised to adopt a package of measures that will impose a cap on the number of ride-hailed vehicles in the city. It’s based in part on the assumption that ride-hailing services like Lyft and Uber are responsible for the city’s growing traffic congestion, and in effect, emulates the medallion system for taxis that’s been in place for decades. 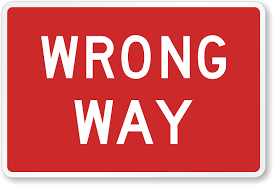 But in our view–and that of other experts like Charles Komanoff and Robin Chase–the real problem is not the ride-hailing services, but un- and under-priced city streets. Limiting the number of ride-hailed vehicles won’t reduce congestion, but will distract from the solution that is most needed and most effective: establishing congestion pricing that applies to all vehicles. 3. Rethinking Housing policy to benefit homeowners and renters. The Brookings Institution’s Jenny Schuetz shares her thoughts on a new direction for federal housing policy. Reviewing recent proposals for Senators Kamala Harris (for a federal rent subsidy) and Corey Booker (for similar plan, coupled with exhorting local governments to upzone residential areas), Schuetz summarizes how we can re-balance federal policies to address affordability for both renters and homeowners. She calls for reining in tax provisions like the mortgage interest deduction and capital gains exclusions (which chiefly benefit high income homeowners) and expanding programs like housing vouchers (that reach only about a fifth of those eligible), as well as requiring local governments to treat proposals for multi-family housing no more restrictively than they do those for single family housing. City size and entrepreneurship. Net new business formation in the US economy has been declining for decades. It’s a signal that maybe we’re not doing a good job creating the innovative new businesses that propel job and wage growth. A new study from the Kansas City Federal Reserve Bank takes a close look at numbers from the Business Dynamics Statistics, which tracks the opening and closing of new businesses. The key measure the study focuses on is the “turnover” rate: the rate at which new businesses replace older ones. 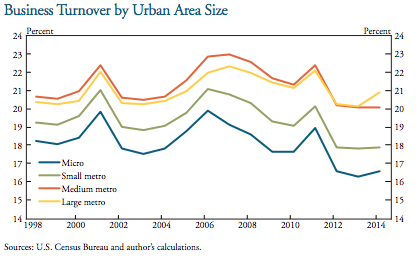 The trend has been downward, but when broken out by metro area size, the data show that larger metro areas are consistently out-performing smaller ones. In addition, in the latest period for which data are available (2013 to 2014), business turnover in the largest metro areas has actually accelerated. Metro areas with more than a million population now have higher business turnover than medium sized metros, a reversal of the pattern that existed prior to the Great Recession. (Hat tip to Issi Romem). StrongTowns shared our proposal that if scooters are asked to pay cities $1 a day for the sue of city streets that the fee charged to cars ought to be ten times or more higher (which it isn’t now). “What Iowa City Can Learn from Portland.” Gazette columnist Adam Sullivan says “I never thought I would have to say this, but let’s make Iowa City more like Portland, Oregon.” He says so after reading our analysis of how apartment rents in Portland have fallen by 3 percent as more new apartments have been completed.